Explainer Videos are wonderful tools for customer engagement. These videos can typically increase revenue 400% for a company. But why should you use explainer videos? Whether it is a new customer, a long-time customer or a casual consumer, everybody wants to learn more about a product or service. But their time is limited and there are thousands of other businesses demanding their time. Therefore, an explainer video is an elevator pitch for your business. Not quite a tutorial and not quite sales mantras, the explainer gives the consumer something new to discover about your business. Today’s share comes from Cinnamon Infographics. While it is packed full of the Explainer Video standards, it does include one recent fact that joins the fold. 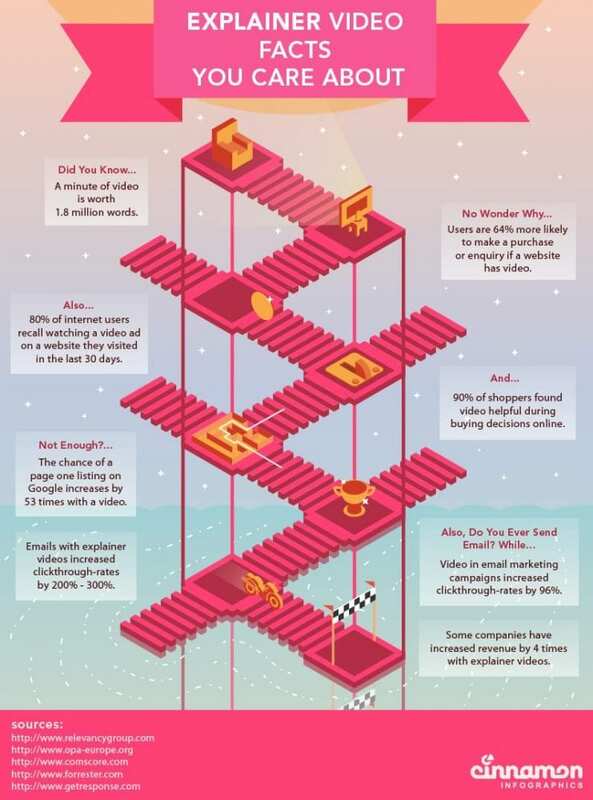 The chances of landing a Google Page 1 listing increases 53% with a video. The users captured by this new attention are 64% more likely to make a purchase after being guided so carefully to a decision by your Explainer. 90% of shoppers find this additional information to be helpful when making a decision. Why? Well, your business took the pressure off their research. Many B2B and B2C purchasing decisions aren’t controlled by one entity. This explainer video can help engage customers, but it also helps explain better marketing approaches to everyone on your team. Feel free to observe some of Autodemo’s past success in generating Explainer videos for a client by clicking here.